The most exciting game was a derby match between two local teams from Panama City: Halcones (#2) and Panteras (#3). Panteras were crushed at home by 19 points 61-80 and even the advantage of their own court did not help. Halcones forced 21 Panteras turnovers. Strangely Panteras outrebounded Halcones 41-29 including 30 on the defensive glass. The best player for the winners was guard Geno Luzcando (190-95, college: Idaho St.) who scored 13 points and 7 rebounds. 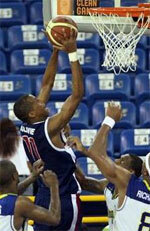 American center Christophe Massie (206-77, college: Memphis) chipped in 14 points and 7 rebounds. At the other side the best for losing team was Dominican power forward Brayan Martinez (203-91) who recorded a double-double by scoring 11 points and 11 rebounds. Both coaches used bench players which allowed the starters a little rest for the next games. Halcones (7-2) have an impressive series of five victories in a row. They keep a position of league leader, which they share with Correcaminos. Panteras at the other side keep the third place with four games lost. An exciting game was played in Colon. Second ranked Correcaminos faced 4th placed Aguilas. Host Correcaminos (7-2) smashed guests from Panama City (4-5) 88-63. It was a good game for American forward Terrence Shannon (203-79, college: Elgin CC, agency: DTMones) who led his team to a victory with a double-double by scoring 17 points, 13 rebounds and 4 assists. Trevor Gaskins contributed with 14 points, 5 rebounds and 6 assists for the winners. Correcaminos' coach Casimiro Laguna felt very confident that he used entire bench and allowed the starting five to rest. 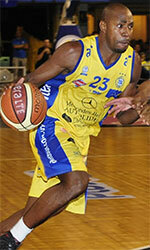 American swingman Lovell Cook (201-90, college: New Orleans) answered with 19 points and 8 rebounds for Aguilas. Defending champion keeps a position of league leader, which they share with Universitarios. Aguilas at the other side keep the fourth place with five games lost. They share the position with Caballos. Bottom-ranked Toros (0-9) tried to put together a comeback for its first victory of the season, but they fell short in the 92-77 loss to fifth ranked Caballos (4-5) in David on Thursday evening. Alvin Cruz stepped up and scored 20 points and 4 assists for the winners. The best for the losing side was Wilbur ONeal with a double-double by scoring 20 points and 16 rebounds. Both coaches tested many bench players saving starting five for next games. Caballos moved-up to fourth place, which they share with Atletico Nacional. Toros lost their ninth game in a row. They still close the standings with nine games lost. The most exciting game was a derby match between two local teams from Panama City: Halcones (#2) and Panteras (#3). Panteras were crushed at home by 19 points 61-80 and even the advantage of their own court did not help. Halcones forced 21 Panteras turnovers. Strangely Panteras outrebounded Halcones 41-29 including 30 on the defensive glass. The best player for the winners was guard Geno Luzcando (190-95, college: Idaho St.) who scored 13 points and 7 rebounds. American center Christophe Massie (206-77, college: Memphis) chipped in 14 points and 7 rebounds. At the other side the best for losing team was Dominican power forward Brayan Martinez (203-91) who recorded a double-double by scoring 11 points and 11 rebounds and Josimar Blenman (200-89, college: Globe Tech JC) added 10 points and 9 rebounds respectively. Both teams had five players each who scored in double figures. Both coaches used bench players which allowed the starters a little rest for the next games. Halcones (7-2) have an impressive series of five victories in a row. They keep a position of league leader, which they share with Correcaminos. Panteras at the other side keep the third place with four games lost. Bottom-ranked Toros (0-9) tried to put together a comeback for its first victory of the season, but they fell short in the 92-77 loss to fifth ranked Caballos (4-5) in David on Thursday evening. Puerto Rican point guard Alvin Cruz (186-82, college: Niagara) stepped up and scored 20 points and 4 assists for the winners and naturalized Puerto Rican Nate Butler-Lind (198-89, college: TCU) chipped in 12 points and 9 rebounds. The best for the losing side was American center Wilbur ONeal (201-88, college: Indianapolis) with a double-double by scoring 20 points and 16 rebounds and point guard Joel Munoz (183-80) scored 10 points, 8 rebounds and 4 assists. Five Caballos and four Toros players scored in double figures. Both coaches tested many bench players saving starting five for next games. Caballos moved-up to fourth place, which they share with Atletico Nacional. Toros lost their ninth game in a row. They still close the standings with nine games lost. An exciting game was played in Colon. Second ranked Correcaminos faced 4th placed Aguilas. Host Correcaminos (7-2) smashed guests from Panama City (4-5) 88-63. Correcaminos had a 36-25 advantage in offensive rebounds. Their players were unselfish on offense dishing 23 assists. Correcaminos brought some defensive toughness making 7 blocks. It was a good game for American forward Terrence Shannon (203-79, college: Elgin CC, agency: DTMones) who led his team to a victory with a double-double by scoring 17 points, 13 rebounds and 4 assists. The former international point guard Trevor Gaskins (188-89, college: Louisiana Tech, agency: Pro Sports) contributed with 14 points, 5 rebounds and 6 assists for the winners. Five Correcaminos players scored in double figures. Correcaminos' coach Casimiro Laguna felt very confident that he used entire bench and allowed the starting five to rest. American swingman Lovell Cook (201-90, college: New Orleans) answered with 19 points and 8 rebounds and Daniel King (203-87, college: Texas Southern) added 8 points and 12 rebounds in the effort for Aguilas. Defending champion keeps a position of league leader, which they share with Universitarios. Aguilas at the other side keep the fourth place with five games lost. They share the position with Caballos.